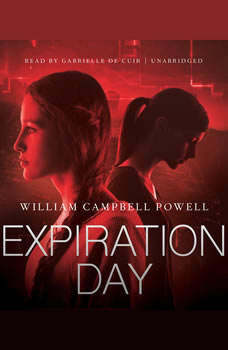 Expiration Day is an insightful coming-of-age novel set in the near future by debut author William Campbell Powell. It is the year 2049, and humanity is on the brink of extinction. Tania Deeley has always been told that shes a rarity: a human child in a world where most children are sophisticated androids manufactured by Oxted Corporation. When a decline in global fertility ensued, it was the creation of these near-perfect human copies called teknoids that helped to prevent the utter collapse of society. Though she has always been aware of the existence of teknoids, it is not until her first day at the Lady Maud High School for Girls that Tania realizes that her best friend, Sin, may be one. Returning home from the summer holiday, she is shocked by how much Sin has changed. Is it possible that these changes were engineered by Oxted? And if Sin could be a teknoid, how many others in Tanias life are not real? Driven by the need to understand what sets teknoids apart from their human counterparts, Tania begins to seek answers. But time is running out. For everyone knows that on their eighteenth birthdays, teknoids must be returned to Oxtednever to be heard from again. Told in diary format, Expiration Day is the powerful and poignant story of a young girl coming of age and discovering what it means to be truly human by a talented debut novelist.